With our upper hand technology in manufacturing fiberglass windows and doors, Fibertec has come up with an enhanced wood clad finish for the 750 Series sliding patio door. This sliding door comes in an authentic oak finish showing off the beauty of natural wood lines to add character to your home. The aesthetics of this patio door come hand in hand with its energy efficient fiberglass frame to meet and exceed not only your style needs, but energy efficiency too. 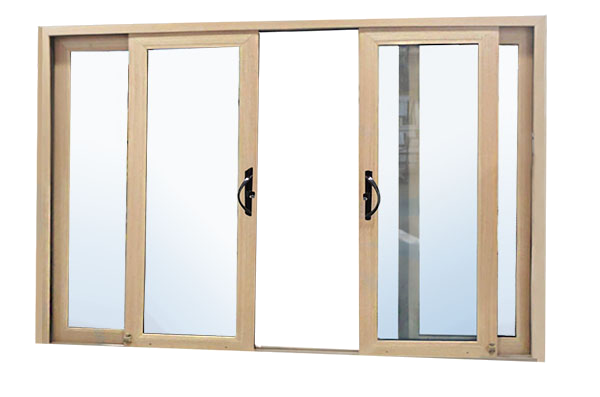 WOODCLAD SERIES SPECIFICATIONS: 5 ¾” Pultruded Fiberglass Frame and Sash laminated with real stainable oak veneer. Custom sizes are also available. Fiberglass doors are available in two, three (end operator only), and four panel (center operators). Fibertec manufactures to sizes specified +/- 1/8" )3.17mm) industry tolerance. STAINING: Fiberglass door slabs come standard unfinished, but is ready to prime and paint or stain. GLAZING OPTIONS:Tempered in and out Double Glazing – 3/4″ sealed units with 1/2″ air space. Tempered Triple glazing (optional) -1 5/16″ sealed units (maximum operator width 32″). Middle glass unit is annealed. PAINT FINISH:Stock exterior colours are white, sandalwood, commercial brown and black. All standard frames come with a white interior or can be painted to any requested colour. Stock exterior colours are white, sandalwood, commercial brown and black. All standard frames come with a white interior or can be painted to any requested colour. Other standard interior colour options include sandalwood, commercial brown and black. All frames use an Acrythane water based paint with UV protector. The paint is rated environmentally friendly due to low VOC. Custom colours are available. HARDWARE:Attractive metal handle on operating panel in white or black, is available with an optional key lock. Also available as an upgrade, # 9700 EURO Handle in Brushed Chrome. As well, optional foot lock allows operating panel to be locked in shut or slightly opened position. SLIDING INSECT SCREEN:Extruded aluminum frame with fiberglass mesh, equipped with spring loaded rollers at the top and bottom to ensure ease of operation and accurate fitting. Thumb lock is a standard feature as well.